Environment: Stockwork mineralization in Ag-Sn mineral belt. Locality: Oploca vein system in the SW corner of the Pirquitas Ag-Sn deposti, NW Argentina. Link to MinDat.org Location Data. 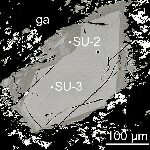 Name Origin: The name honors R. J. Sureda Leston, head of the Department of Mineralogy end Economic Geology, University of Salta, Argentina. RL Anisotrophism: Rotation tints of metallic blue to mauve to brown. note: Specific Gravity of Suredaite =5.56 gm/cc. U=PESuredaite x rElectron Density=4,121.30 barns/cc.